When arriving in a new country by plane, there is never an issue about the time differences as when you land you get the usual spiel from the captain about the time, temperature, etc. But when you cross borders by land, whether on foot or by bus you are left with your own devices. I had read somewhere that there was an hour difference between Argentina and Chile, so when we crossed into Chile yesterday we turned our clocks back by one hour. This made sense to us seeing as though when we crossed from Bolivia to Argentina the time went forward an hour. And as we’re moving west, nothing seemed out of the ordinary. That was until we tried to catch a bus to the hot springs. The lady at the hostel told us that there was a bus at 1.30pm every day from the bus station. Just 15 minutes before they leave, the bus pulls right outside the hostel to wait before collecting its passengers. At 12.15 we saw a bus pull up outside the hostel. Not thinking, we were like hmm..there’s a bus outside the hostel. Around 1.15pm, we noticed that there wasn’t a bus outside the hostel but we decided to head to the bus station anyway. There were no other tourists about and then we asked a guy at the station when the bus for the hot springs would arrive and he was like its gone. We went back to the hostel and found the hostel lady to ask what the time was. For the past 24 hours or so we had been living one hour behind the normal time! This is the second time that we’ve missed a bus because of the time difference between countries though this one was probably our fault as there wasn’t any time difference between Chile and Argentina. Annoying! Once we established the time, we decided to just get a bus to visit the small town of Villaricca which was just a 30 minute bus journey away. Even this bus (a local bus) was a coach. The really local buses are like big minibuses. We arrived but a downpour had just started so we quickly walked around visiting the local market and eyed up some clay pots but decided against buying them as they were too heavy to carry or post back. 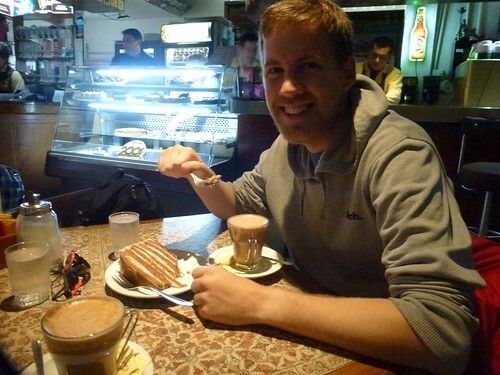 In the end, we found a nice little cafe and drank tea and ate a slice of cake each. With the rain still coming down, we decided to jump back onto the bus to Pucon. This entry was posted in Border crossing, Chile, Day Trip and tagged argentina, border crossing, cafe, chile, time difference, villarrica. Bookmark the permalink. One Response to "Day 90 – Time difference between Chile and Argentina"